What happened to the weekend giveaway? Keep reading! I am including this past week's giveaway at the bottom of this post! 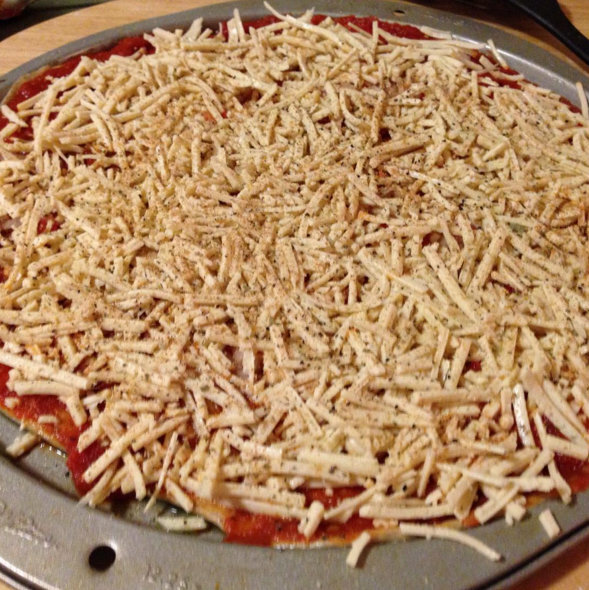 Before we get to that I figured I would show you my vegan pizza I made on Saturday Night! Hubby went to Pittsburgh for the Steelers game and I went to Buffalo for the Bills game. More on that in a near future post. Hubby left for Erie to meet up with his brother on Saturday afternoon and headed for Wegman's in Lakewood and grabbed some Daiya Cheese. 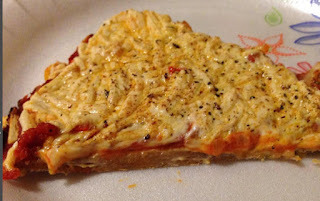 I then went over to my parents and made some of the Wildtree Pizza Dough that happens to be vegan and then added Sauce, Daiya, Onions, Peppers, and spices to it. My parents had some of the vegan pizza and enjoyed it, too! The first photo is before I baked it and this 2nd photo is after it came out of the oven. We added some more spices to the top, too! It was tasty! I ate 3 pieces. BUT...it was VERY thin and I hadn't eaten much on Saturday...a little but of grits but that's it. We put the onions and peppers in between the sauce and the Daiya! After making and eating the Vegan Pizza my mom and I made 3 different raw vegan desserts and I will be sharing those with you in future posts as well! It was fun spending time with my parents this weekend and then on Sunday when we went to the game I got to see my sister, too! I wish I had more veggies to add to the top of this but it still turned out yummy! And here's a close up of a slice. In case you were wondering I used a Wegman's Marinara that also happened to be vegan. The spices were Wildtree Spices. We sprinkled a little bit of the California Garlic Pepper and a bit of the Spicy Chipotle Ranch...yes...both vegan! I've been hungry for soups so I will have soups on tap this week at some point among other things. Sometimes when I indulge in vegan packaged convenience foods or vegan junk foods I sometimes will take a supplement...or if I am on the road for a few days to fill in any holes I may put upon myself. 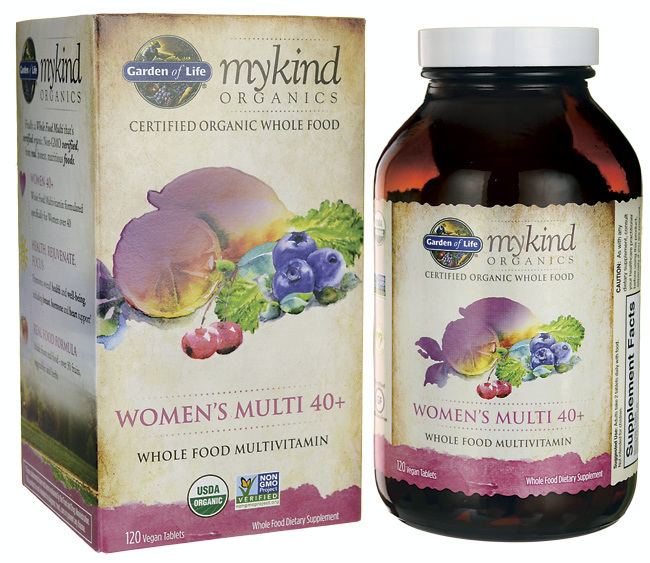 I really like some of the Garden of Life Products that I have seen come across me lately - more specifically their sister company MyKind Organics which is a Certified Organic Whole Food Vitamin Company which is also vegan. This is the company that Alicia Silverstone is the spokesperson for. Today I am posting about their Women's Multi 40+ Vitamins. They are allowing me to give a bottle of them away. If you are a US Resident and would like to win these please leave me a comment along with your email addy. I will choose a winner sometime Wednesday! A little disclaimer...I was not paid to post this offer, however, Garden of Life allows me to do giveaways on my blog in exchange for honest reviews, recipes, and link-backs. The pizza sounds and looks great! Can't wait for more on the desserts and game! Thank you for the opportunity, I like that MyKind Organics are quality, well-rounded, vegan friendly vitamins. Thanks! I was pretty pleased with the raw vegan dessert attempts! I have to say! Pizza! 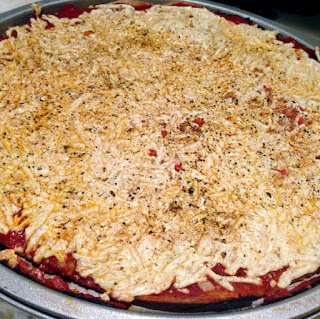 I have been craving a good vegan pizza! This post inspired me for tomorrows dinner! 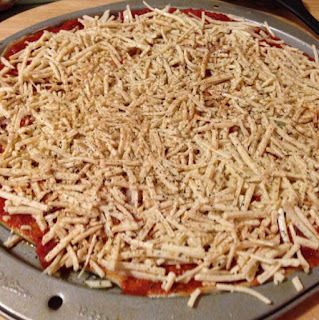 I like to sprinkle extra spices on my pizza before and after baking too! Spices really take it to the next level!! Thanks for visiting, commenting, and participating! The pizza looks so yummy. I love pizza a lot. That pizza looks so good! That pizza looks yummy! Thank you for the giveaway.